What Do You Feed Your Soul? The sad part about this wonderful display of divine power by Christ is that some people could not care less that Jesus was the Son of God. They were just interested in what Jesus could do for them. Look at what He tells them when He says, “you seek Me, not because you saw the signs, but because you ate of the loaves and were filled.” (Jn 6.26) What an ungrateful thing it is to look at God and basically say, ‘what have you done for me lately?’; especially when He had so richly blessed them by feeding so many just the day before. In the face of such selfishness, how would you feel? How would you react? I know many people would be hurt and lash out at such an uncaring attitude. Jesus however uses this as a teaching moment and says, “Do not labor for the food that perishes, but for the food which endures to everlasting life, which the Son of Man will give you, because God the Father has set His seal on Him.” (John 6.27) You would think that they would pump their fist in the air, yell YES, and do a little happy dance. I mean, who would not want that kind of food?!!! Unfortunately, these guys were not only selfish, they were dense and selfish. Can you believe their response to what Jesus said was to ask how they could get the power to work the miracles of God? They said, “What shall we do, that we may work the works of God?” I don’t know about you but I think I might have lost my cool at that point, but not Jesus. He goes on to essentially say, ‘OK, you want to do the works of God, here is what you do.’ “This is the work of God, that you believe in Him whom He sent.” (John 6.29) That’s awesome! Even I can do that work of God, so can you, but the men Jesus was speaking to still did not get it. They just could not see past their own self-importance, selfishness and pride. Friends, while the food that fills our stomach is important, it is nothing compared to the food that can fill our soul! 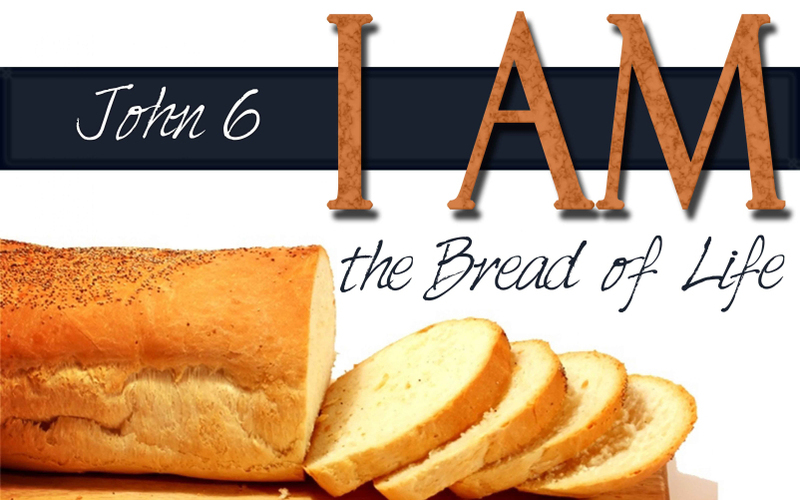 Jesus is the very bread of life that can strengthen your soul and feed you for eternity. Please, do not let selfishness, pride, or the problems and cares of this earthly life keep you away from that which can feed your soul forever…Jesus and His word. Think about it. Not too long ago now, there was an argument raging in the city of New York over the mayor’s dictate that a person cannot buy a single soft drink 32oz or larger. 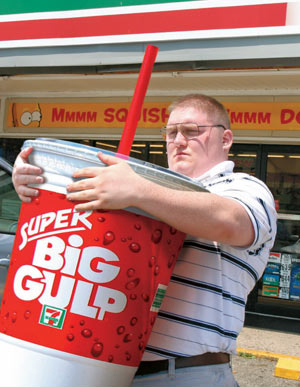 If you want a ‘big gulp’ from Seven Eleven then you will just have to buy two smaller ones and drink them both. The situation ignited the airwaves with controversy, something we Americans seem to thrive on. One nutritionist argued that America is eating itself to death, literally. Obesity rates are higher than in any other country she said. Not to mention the deaths caused by heart attack and diabetes that can be caused by overconsumption. While I do not accept the mayor of New York’s solution to sugar consumption, I did have to agree with one thing. We are a nation addicted to things that are not good for us both physically and spiritually. When we are hungry, we eat, but often it is too much ‘comfort’ food. I wonder, do we feed our minds in the same way? We soak up shows like Duck Dynasty when we want to sit and relax…for hours. People spend more time in activities like texting or messaging friends than they do in even considering their own soul. Others just don’t have time to consume spiritual food, opting for the world’s drive through instead. If our desire is to be with God in heaven forevermore, then we have to find the strength to put ourselves aside and pick up the cross of Christ, every day. We must develop the courage not only to be seen with Christ, but to stand up for His cause. To be honest, it doesn’t matter if you want to walk around with your 44oz Coke from Sonic, it’s OK. But if we fill ourselves to overflowing with the world instead of God, then we will die a spiritual death. Don’t die a spiritual death! Take up your cross, open the Bible, eat the bread of life, drink spiritual water, feed your soul, follow in His steps and live with the Lord forever.